The (...) is the variations i.e. .app .common .daagent .smartmirroring etc. I thought this may have been from the teamviewer app but they are installed on different dates and I haven't been able to find any reference to JaneLuxuryblue on the net. Welcome to Android Central! Are you able to uninstall those apps? The apps are only visible through the teamviewer portal. I can't see them when looking at apps through the phone settings menu and I don't have nay apps by that name installed. Here's a screen shot. The columns are name, version and date installed. Sorry, but I'm not familiar with TeamViewer's functionality, so I'm not sure what to make of that. If you go to Settings>Apps and then tap Menu>Show System, do those apps show up then? Teamviewer just allows you to mirror and control the phone or remote computer. The Teamviewer and Teamviewer QuickSupport apps are show further down the applist so Teamviewers only involvement is exposing the 'Jane' apps. The Janeluxuryblue apps dont show at all on the phone, not even in system apps. Solved, A friend suggested it might be the name of a samsung theme. That was the case. 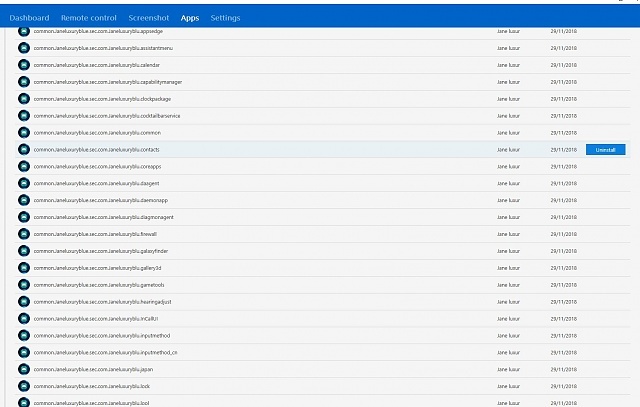 After changing themes the 57 odd apps exposed through teamviewer were replaced with a similar number of apps with the new theme name. B. Diddy and Rukbat like this.